Over the years I’ve done a great amount of work for Wikipedia especially when concerning James Bond articles, but in more recent times, say the past year or so, I’ve grown rather distant with the entire project for a variety of reasons (note that I am an administrator there). At one point, I decided to just up and leave and perhaps start my own wiki focused on James Bond. I scrapped that idea and I finally settled on the site you’re reading now. But prior to this, during that time in which I thought I might start the wiki, I took the time to do a good breakdown of Raymond Benson’s first novel Zero Minus Ten complete with information on the continuity with other continuation novels, a plot synopsis, trivia, and a breakdown of practically every character in the book. It didn’t really take as long as you might think, but when the plans for this wiki or whatever I was aiming for fell through, I took some of the information (that which can’t be considered “fancruft”), added it to Wikipedia and put the rest aside in hopes that one day it wouldn’t go to waste. I guess now is the time to share it. 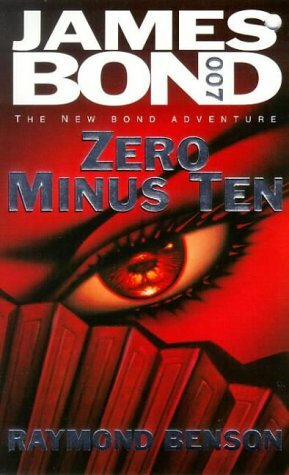 I suppose the reason I chose Zero Minus Ten to start with is because no one really ever gives the attention (sometimes) these continuation novels deserve. Ian Fleming is a great author, and I love his books dearly – no one will ever do it better in my eyes, but every time someone writes a non-fiction book dedicated to the literary James Bond, it’s focused solely on Fleming. Oh, and there are these other chaps, Amis, Gardner, and Benson. They wrote some stuff too. Not all books are like this though. The Bedside Companion for one, and I would like to make special mention of Paul Michael Kane’s upcoming second edition of 007: A Literary Dossier, which when released will have synopses of all 35 Bond novels (apparently lacking the 2 most recent Young Bond novels), the 7 film novelizations and all spin-off novels to date. At some future point, I may convert this to a wiki, it really depends. There are times when I’d like to do it and then there are times when I don’t. Perhaps I should write a book instead in a James Bond Bedside Companion mold, but I’m not much of a writer. If this is well-regarded, I may continue on. I actually have The Facts of Death about 50% done. I just never put the remaining effort into completing it. — As always if you see a mistake let me know. Comments are open and feedback of any variety is always welcome. Interesting so see all the reviews were positive. I vaguely remember that on publication the views were that Benson was an improvement on Gardner dwindling enthusiasm for his projects. I remember having similar views at the time, though they weren’t quite as glowing as those listed. Hindsight and rereading both Gardner and Benson has perhaps now dampended those opinions! What do you think, Kevin? I started off liking Gardner, but after a few they just seemed really drab and strung out. So for me, Benson was like getting a breath of fresh air. There are some things that bug me about Benson’s writing and some of the plotlines or sequences, but all in all I think Benson did a good job. Unfortunately, it’s rather hard to find critical reviews of a 10 year-old book on the Internet. So that’s pretty much why they’re all positive.